As I have mentioned before, Robert Hastings has given us UFOs and Nukes and it has provided some very interesting information about the state of UFO research and what the government might know about it. I don’t think he realized by doing that he has also dealt another blow to the Project Mogul explanation for the Roswell recovered debris. Mogul, for those of you who might have been living in a vacuum this last decade or so is the preferred explanation of the skeptics, the debunkers, the Air Force, much of science and more than a few people who would rather let someone else do their thinking. Mogul was an attempt to put an array of weather balloons, radar reflectors and some microphones into the atmosphere at a constant level so that we could spy on Soviet attempts to detonate an atomic bomb. So, what does Hastings tell us that affects this? According to him, "In September 1947, Army Chief of Staff General Dwight D. Eisenhower directed the Army Air Corps [actually the Army Air Forces] to undertake the Constant Phoenix program, an ongoing series of long-distant flights designed to detect atomic explosions ‘anywhere in the world.’ This high-priority activity was continued by the newly-created U.S. Air Force and, on September 3, 1949, radiation sensors aborad a USAF B-29 flying between Alaska and Japan confirmed the detonation of the first Soviet atomic bomb - some five years earlier than expected." What this tells us is that within weeks of the Roswell events, the Army Air Forces were directed to use aircraft in their surveillance of the Soviet Union’s atomic progress and that balloons did not figure into it. Mogul was of no real interest to the military at that point, which might explain why it was compromised by the military in July 1947. Any spying on the Soviet Union would be accomplished by aircraft that could maintain their flight levels for hours on end, which weren’t directed by the wind, and which could carry human observers who could make additional observations. And, as we learned, were not required to penetrate Soviet airspace so there would be no debris lying around for the Soviets to exploit. Those who struggle to convince us that Mogul was so secret, so important, that finding an array by Mack Brazel had to be covered up to protect the project fail to explain why pictures of Mogul arrays were printed in July 10 issues of various newspapers. They fail to convince us the project name was unknown to the members of the Mogul team as the Air Force’s own investigation proved. And now we learn that plans had been in the works to use aircraft for surveillance before the Mogul launches in New Mexico, and that Army Air Force missions were implemented within weeks of the Roswell discovery. We can argue about what really fell at Roswell. We can argue about the efforts to recovery it and to hide it but we can now lay to rest the idea that Project Mogul was responsible. Clearly the effort made to keep the secret would not have been made had it been Mogul balloons. We know this because other arrays, that fell in other parts of New Mexico, were left to rot in the sun if recovery was deemed too difficult. Mogul fails on so many counts. It wasn’t the secret that we have been led to believe it was. There wa s nothing mysterious about its make-up and the balloons and radar targets were off the shelf items. 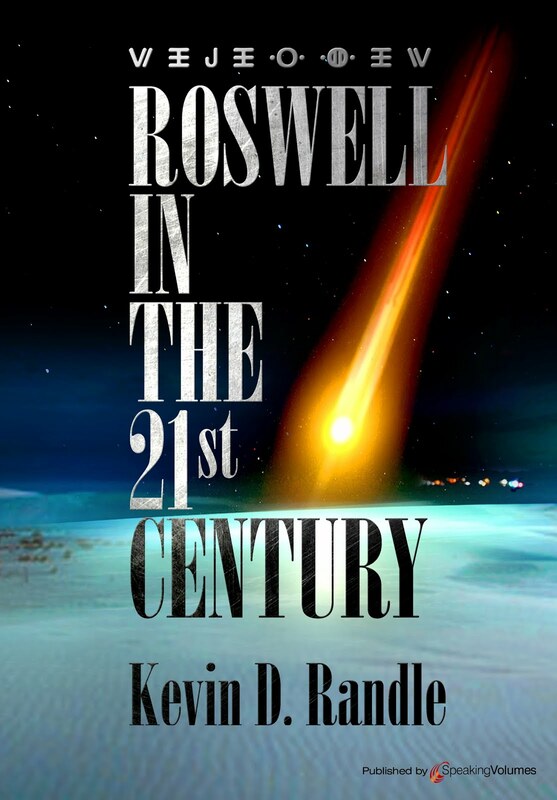 The officers, pilots, and soldiers at Roswell wouldn’t have been fooled by the debris and, in fact, had been warned by the Mogul team that the flights would be made. And once the events at Roswell began to unfold, Mogul ended up on the front pages of many newspapers complete with pictures of the balloons and some of those who launched them. This last bit if information, courtesy of Robert Hastings will, I hope, put an end to the idea that Mogul accounts for the Roswell debris. Let’s move on to something else, something that makes sense. Let’s put Mogul back in the bag. I was reading a new book the other day, Strange Company by Keith Chester (seen here), and realized a couple of things. First, we’re going to have to change the history of the UFO phenomenon. 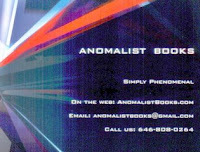 Until this book came out, we all dated the "modern" era from the Kenneth Arnold sighting of June 24, 1947. It is now clear that the modern era began during the Second World War. Let me explain that quickly. Chester’s book is about the foo fighters that we’ve all heard about. I believed that these were balls of light, maybe St. Elmo’s Fire or the like, that followed Allied aircraft on their missions during the war. I had thought of them as indistinct, small, glowing orbs of ionized air and that while some pilots thought of them as possible enemy weapons, there wasn’t much to them. Chester, in his book details hundreds of sightings, many of them suggesting large, solid objects. Chester, using the style of the 1960s UFO books, gives us many sightings, but he includes the names of the witnesses and often the documents, once classified, but now housed in the National Archives that provide the details. He also tells us of a coordinated effort on the part of Allied intelligence to identify the objects, believing them to be either new German weapons, or in the Pacific, new Japanese weapons. Our aircraft fired on them more than once, but there seems to have been no retaliation and while the capabilities of these objects worried the Allied powers at the highest levels, there seemed to be no actual indications that they were any sort of enemy technological break through. There was a large intelligence effort to solve the riddle of the foo fighters with many believing that at the end of the war they would learn the truth. That didn’t happen, but with so many of the sightings classified, no one really talked about them. True, some of the high ranking officers or scientists on the other side were interviewed, but they were as confused as those on the Allied side. Only once in a great while would something appear about the foo fighters, but my impression, and I’m sure that of others was that, from a ufological point of view, there was nothing much to them. The modern era, then, begins not in June, 1947, but during the war... and I haven’t even approached the idea of the Ghost Rockets seen in Europe in the summer of 1946. This was a series of sightings that mirrored those that would be reported here in 1947. We basically ignored it because the sightings were limited in scope and many believed them to be the result of hysteria that survived the war. (And yes, I know that US government sent Jimmy Doolittle to investigate, but that really is a subject for another posting). Now, all of this is very interesting, but there are a couple of names that surface in Chester’s book that I found just as interesting. One of them is Colonel Howard McCoy. Many inside the UFO field don’t know who he was, but in 1947 and later, he held an important intelligence post. He was the chief of T-2 of the Air Materiel Command’s intelligence division that included oversight of Project Sign, the original UFO investigation. Given the interest in the flying saucers (a term in widespread use in 1947 contrary to the opinions of a few in the UFO field) the Air Force created a science advisory board chaired by rocket expert Theodore von Karman. They held their first important meeting in March, 1948 and in attendance was McCoy. The minutes of that meeting were declassified in 1996. During that March meeting, as McCoy briefed the scientists about the intelligence mission, McCoy said, "We have a new project - Project Sign - which may surprise you as a development from the so-called mass hysteria of the past Summer when we had all the unidentified flying objects or discs. This can’t be laughed off... We are running down every report. I can’t tell you how much we would give to have one of those crash in an area so that we could recover whatever they are." McCoy, then, had been charged, indirectly, with the investigation of the flying saucers. If this was his first brush with that, we could make a number of arguments but those simply won’t fly when we examine the information that comes from Chester’s book (seen below). We learn that in August, 1944, the Allies created the Combined Intelligence Objectives Subcommittee (CIOS) which was charged, in part, with the problem of the foo fighters. They held their first meeting in London on September 6, 1944, and what is interesting is some of the representatives who are there... one, Commander Ian Fleming, I mention simply because he would w rite the James Bond novels, but two of the others are Howard Robertson of the 1953 Robertson Panel on UFOs and another is Colonel Howard McCoy. That’s the same McCoy who would find himself charged with the first official investigation of UFOs in 1948 known as Project Sign (and called Project Saucer in the public arena for those who didn’t think they used the term then). But what is interesting here is that we find that reports about the foo fighters have ended up like those of UFOs. Those in a position to know what was happening produced classified documents that have now disappeared. A great deal of data had been gathered and while it seems that many believed the foo fighters to be enemy weapons, that certainly wasn’t the case. Interrogations of high-ranking officers and captured scientists, after the war, showed that they knew no more about the foo fighters than did the Allies. All sides seemed to believe that the foo fighters belonged to the other. When we reach 1947, McCoy found himself in the same place he had been during the war. Reports of strange objects in the sky, not just bright lights or balls of fire, but of solid, metallic craft coming from trained pilots. True, there were more reports from civilians and it’s probably true that the military didn’t care about those, but they were getting reports from both military and civilian pilots. Those couldn’t be ignored. McCoy still had no answer. All he knew was that something that had appeared during the war that had seemed to be confined to the combat arenas in Europe and the South Pacific were now over the United States. He still didn’t know what they were, and that might have colored his thinking. After the sightings over Washington, D.C. in the summer of 1952, the president wanted some answers. One of the things done was the creation of a scientific panel to study the UFOs, using the best of the cases from what was then known as Project Blue Book [which had superceded Project Grudge which had superceded Project Sign]. This panel was sponsored by the CIA and who chaired it? Howard Robertson, the same guy who had worked with McCoy during the war. Other members of the panel was Luis Alverez and Samuel A. Goudsmit, who were both involved in the investigation of the foo fighters. About the only person missing from the list was Howard McCoy, but then, McCoy did have representatives there in the guise of the Project Blue Book officers whose role was to provide information for the panel. Their conclusions, which were probably influenced by their investigations of the foo fighters, was that the flying saucers posed no threat to national security. If we count the foo fighters in the UFO mix, then these things had been around for more than a decade and there were no reports of flying saucers damaging our national security at that time. The Second name that caught my attention was William Blanchard. In 1947 Blanchard was the commanding officer in Roswell but during the war he commanded the 40th Bomb Group. I wouldn’t mention this, except that during the October 25, 1944 mission, three of his B-29 crews reported high-altitude balloons on three separate occasions. About three years later, a high altitude balloon called Mogul would allegedly fool Blanchard’s intelligence officer and Blanchard himself. He would order then Lieutenant Walter Haut to issue a press release saying they had captured one of the flying saucers. Makes you wonder what it is about Blanchard and high altitude balloons that kept him, or members of his unit, from identifying them. What this shows is that the all the early UFO phenomena is interconnected with the same names popping up in the early history. Those who investigated the foo fighters, those who saw and reported foo fighters were those who reported flying saucers and who investigated them. The one common element in all of this is secrecy. First a secrecy borne in the necessity of the war and later a secrecy that is the natural outgrowth of high level military and scientific thinking. But it is a secrecy that has inhibited UFO research from the very beginning and it is a secrecy that is only now being lifted so that we can glimpse the truth. It was in the 1960s that the Air Force decided to hire a university to make an impartial study of UFOs to determine if there was a reason for the Air Force to continue to investigate them. The so-called Condon Committee, at the University of Colorado, was formed and began their work in the 1967. I won’t bother here with the details about why I think this was a set up and neither the Air Force nor Condon planned to make a true objective analysis. All this is important because, on December 3, 1967, during the investigative phase of the research project, a police officer in the tiny community of Ashland, Nebraska, reported that he had seen a UFO close to the ground, hovering no more than six or eight feet above the highway. When he turned on his bright lights for a better look, the saucer-shaped object brightened, tilted upward, and then with a siren-like noise, lifted and vanished. Sergeant Herb Schirmer (seen below courtesy Warren Smith) opened his car door to watch as the craft rose, spouting a flame-colored material from under it. He would later say that he saw a row of seven portholes, oval shaped and about two feet across. He said he saw a catwalk around the object, below the portholes and that the surface of the object was polished aluminum that glowed brightly in reflected light. The first part of the Condon Committee investigation of the sighting took place on December 11 and 12, 196 7, and that date becomes important later. In the summary of the report, the Condon Committee investigator wrote, "Mr. Schirmer felt perhaps he had not been conscious during a period of approximately 20 minutes [emphasis added] while he was observing the UFO. He had a feeling of paralysis at the time, and felt funny, weak, sick, and nervous when he returned to the police station." In another part of the investigation that would become important later, the Ashland police chief Bill Wlaschin, said that he checked the area the next morning but found nothing of great importance there. He did find a single piece of metallic-like material that he did not recognize. It looked to be a chip of aluminum paint but I found no analysis attached to that report or to the various other reports I have. In the published version of the Condon Committee, called the Scientific Study of Unidentified Flying Objects (Bantam, 1969), the material was described as iron and silicon and since there was no real connection between the sighting and the material, no further analysis was done. They searched the site where Schirmer, after hypnosis, would say the UFO had actually landed. They tested for radioactivity but found nothing. A polygraph for Schirmer was arranged using an experienced official agency that Chief Wlaschin refused to identify. According to the chief, the test showed no indications that Schirmer was deceptive. In other words, he passed. John Ahrens, of the Condon Committee returned to Ashland about a week later, on December 19, to give a psychological test to Schmirer. Schmirer agreed to take the tests. On February 13, 1968, after the time discrepancy between Schmirer’s log and the time he returned from the UFO sighting became a concern, another interview was held. Remember, though, Schmirer said there was a short period in which he believed he had been unconscious, so the first real suggestion of missing time is probably attributable to Schmirer himself. Some suggest that one of the scientists with the Condon Committee, probably Dr. Leo Sprinkle, suggested the missing time might be significant. However it happened, or who noticed it is not all that important, unless it was Schmirer who called attention to it first. Then we have him planting the seeds that would lead to his claimed abduction. The writer [Sprinkle] believes that there is sufficient empirical evidence to support the views that the following phenomena exist: hypnotic processes or varying levels of awareness; extra sensory perception and psychokenetic (sic) processes (ESP or psi processes); and spacecraft ("flying saucers") from extra terrestrial sources which are controlled by intelligent beings who seem to be conducting an intensive survey of the earth. Because these views are different from those of many persons in contemporary society, the writer [Sprinkle] offers his impressions with the recognition that other observers may have obtained different, and even conflicting, impressions of the interview with Sgt. Schmirer. Under the hypnotic regression, first with Sprinkle, and later regressions coordinated by Warren Smith, an Iowa writer whose work dealt with the paranormal, the unusual and the extraterrestrial, Schirmer told a story that was fairly consistent, though he added detail under the persuasion of hypnosis and the close questioning of the investigators. And there were his log entries that backed up, to a degree, the story he told. In was early in the morning of December 3, that Schirmer began to suspect something was wrong. He told the original investigators that a bull in a corral at the edge of town was acting strangely and he was afraid that it might break out. At 2:30 a.m., according to what he wrote in his log, he was near the intersection of Highway 63 and Highway 6, when he saw an object hovering over the road. He didn’t believe, at that time, that it landed and only gave a description of it in the air. It eventually climbed out and disappeared. Schirmer then drove back to the police station to report in. That was really all he had to say about the sighting. Later he would tell investigators that the craft hadn’t been hovering above the highway but was sitting in a field near it. Sprinkle wrote, "He [Schmirer] stated that a bright light had shone from the object upon the car and that he saw a ‘white blurred object’ which came toward the car. He said he felt he was in communication with someone in the object, and that he also felt the communication was in effect during the interview [meaning that while Sprinkle had him in a hypnotic state, Schmirer thought he was mentally in contact with the aliens]." Schmirer told Sprinkle that he, Schmirer thought it would be wrong to say anything else about the sighting until they were in the proper place at the proper time. Schmirer resisted the attempts by Sprinkle to learn the proper time and place, so Sprinkle ended the session. They did learn that a bright light came from the object, a white, blurred object approached the car and then seemed to fade, the craft them moved upward, a weird sound came from it and a bright red-orange glow came from under it. The UFO then shot straight up and out of sight. After the session ended, Schmirer said that he thought the "white, blurred object" was something alive. He mentioned that he believed he had been in direct mental communication with someone on the craft. Schmirer believed that the craft used electrical or magnetic force which controlled gravity and allowed them to travel through space and that they were taking electricity from some nearby power lines. He said that the beings on the ship were based on Venus or Saturn but were from another galaxy and that they were friendly. They were here to keep the people of Earth from destroying the planet. Schmirer agreed to take a number of psychological tests. Let’s just say that the results tended toward the negative. His I.Q., for example, was on the low side for conceptual thinking, but on the high side for dealing with concrete intellectual tasks such as puzzle solving. The problem for the scientists at the Condon Committee were that, "His [Schmirer’s] performance on the word association test causes one to doubt his honesty in the UFO sighting, or at least seems to indicate that he himself disbelieves the credibility of the sighting." But this doesn’t really tell us much. It could be that Schmirer was lying, but it could also be that he found the experience to be unbelievable. Given what he would later say, that he found the experience unbelievable isn’t much of a stretch. The scientists also noted that "He is also preoccupied with seeing UFO objects." But they also noted that he was given the tests after reporting a UFO and that might account for his obsession at the time. So now we move into a new arena. Warren Smith, a sometimes writer living in Clinton, Iowa, wrote in Gods, Demons and UFOs, that Schmirer contacted him. Schmirer, dissatisfied with the results of the Condon Committee investigation, wanted to push for answers. Smith and paranormal expert and writer Brad Steiger met with Smith on several occasions. Under hypnosis conducted by Loring G. Williams, Schmirer added a great deal of detail. He said that the object was metallic and shaped like a football. It had flashing lights underneath it. He thought he heard a whooshing sound. Finally he saw legs coming from the bottom and it settled to the ground. He originally hinted to the Condon Committee members that he had been prevented from using his pistol or his radio. Now he clarified that, telling Smith, Steiger and Williams that there was something in his mind that prevented him from acting. Creatures, aliens, beings, something came from the craft and one of them stood in front of his car holding something. A greenish gas came out surrounding the car. Then the creature in front of the car pulled something out of a holster and there was a bright flash. Schmirer said that he was now paralyzed and passed out. Schmirer was then walked to the craft. Under it, a hatch opened and a ladder came out. Schmirer noticed that the interior of the craft and the ladder were cold. He spent about 15 minutes on the craft and was "briefed" by the leader. The creatures were about four and a half to five feet tall, wore close fitting uniforms with both boots and gloves. Their suits came up around their heads much like the hood on a skin diver’s outfit. On the left side was a small headphone with a small antenna sticking up from it. There was a winged ser pent on the chest. 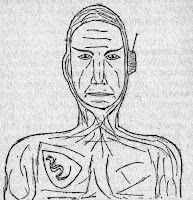 He said that the skin was a grey-white, that the heads were thin and longer than a human head, the mouth was a slit and the eyes had an Asian slant but did not blink (Drawing of alien by Schirmer seen here, courtesy of Warren Smith). The leader told him many things. He said they have bases in the United States and off the coast of Florida. They have a base in the polar region and there are other bases off the coast of Argentina. Radar can knock their ships out of the air, but the mother ship destroys them before they can crash. After the briefing, Schmirer was taken back to the hatch. The two crewmen who remained outside climbed back in. Schmirer walked back to his police car. He returned to Ashland and arrived at the police station about three. In his log he wrote, "Saw a flying saucer at the junction of highways 6 and 63. Believe it or not." Warren Smith reported that he had found the landing site, an unplowed sloping field. Smith claimed to have seen landing gear markings and patches of grass that had been swirled and twisted. He wrote, "Some very impressive evidence has been embedded in an unplowed, sloping field just above the highway. Three-pointed tripod marks were sunk deep into the earth. Patches of grass in the field are swirled into an unusual pattern, as if the vegetation was whirled by some powerful centrifugal force. The patches of grass are darker in color; it grows higher and faster than surrounding vegetation." He was there weeks after the investigators for the Condon Committee who reported nothing of the sort. Smith, who suggested that he was something of a photographer failed to take pictures of the evidence, or to even make notes and illustrations of it or later review. You might say, at this point, that these are the facts and they are not in dispute... except that some of this isn’t factual and there are areas for dispute. Let’s take a look at this with a dispassionate eye. We know that Schmirer reported seeing a flying saucer and that in his initial report it was in the air. We know that he logged the sighting and we have a record of that log. We know that there is a discrepancy between the times in his log and his return to the police station and that discrepancy is only about twenty minutes. Not very much time for him to be captured, taken into the craft and given both the tour and briefing that he later, under hypnosis, reported. Here are a couple of things we don’t know. We don’t know who originally discovered the discrepancy in the times. Some suggest that it was one of the police officers, or possibly Schmirer himself that noticed the timing problems. Others suggest that it was Sprinkle. I don’t know who did, but I do know, according to the notes made about the interviews with the Condon Committee members held in February, that there was a morning that was an "orientation session - Leo Sprinkle probed the witness and laid certain groundwork for the afternoon session." This was after the initial investigation completed in December. What I don’t know is exactly what was talked about during that morning session. I had watched Dr. James Harder, in his preliminaries before hypnotic regression in another abduction case discuss details of other UFO sightings with the witness. Harder was looking for validation of the Barney and Betty Hill abduction and it is clear from his questioning of the witnesses under hypnosis and his discussions with them before and between sessions what he wanted. I have been unable to learn the contents of the morning session held with Schmirer, but I would suspect a similar discussion. Sprinkle noted that "Sgt. Schmirer seemed to be faced with conflicting wishes: th desire to be seen as a competent observer and courageous policeman versus the desire to be considered ‘his own man’ rather than a puppet which could be controlled through suggestion and hypnosis." This might be important because Schmirer, during that first hypnotic regression, refused to provide much information. Instead they used yes and no questions to get more information and I have a copy of those questions. They hint at something more substantial, but offered little to suggest that he had entered the craft. Instead, he seemed to believe that he had been in "communication" telepathically with one of the aliens. 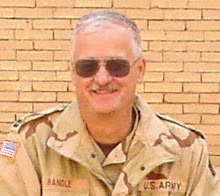 Now, in an aspect of the case that hasn’t been discussed much, but one that I find quite disturbing, Sprinkle wrote about a break in the questioning, "Sgt. Schmirer described some of his reactions to the sighting: he said that he drank two cups of hot, steaming coffee ‘like it was water,’ he claimed that he often experienced a ‘ringing,’ ‘numbness,’ ‘buzzing’ in his ears before going to sleep (around 1:30 a.m. or 2:00 a.m.): he believed he had experienced precognitive dreams... he said he felt concern and ‘hurt’ since the UFO sighting; he described disturbances in his sleep, including incidents in which he awoke and found that he was ‘choking’ his wife and ‘handcuffing his wife’s ankle and wrist; he said that his wife sometimes woke up during the night and placed his gun elsewhere so that it was not in his boots beside his bed where he had been keeping it." Although Sprinkle had suggested that Schmirer was of "average or above average intelligence... He presented himself as a conscientious policeman who has a sixth sense or intuition about crime detection; he also seemed to gain satisfaction from the occasional need for violence in his work, although he spoke favorably about the use of MACE." As noted earlier, Sprinkle mentioned his personal belief in a number of paranormal phenomena, which suggested he would be less likely to question Schmirer closely about portions of his report, the above seems to mitigate all that. This assessment, which is not nearly as bold as that of other scientists involved in the case, is, nonetheless quite troubling. It suggests a young man who has a number of possible psychological problems which could manifest themselves in the UFO report. Couple that to the Condon Report suggestion that "His performance on the word association test causes one to doubt his honesty in the UFO sighting, or at least seems to indicate that he himself disbelieves the credibility of the sighting," and the evidence for a UFO landing is not quite as persuasive. On this one issue, which, frankly, can be reduced to whichever set of scientists you want to believe, the Schmirer case fails. Sprinkle reported on psychological troubles but not in the same, bold language used by others. We can say, then, that th e only real investigation was that reported by Warren Smith (seen here). Smith, contacted by Schmirer, arranged more hypnosis and the details of the abduction came out. The problem here is that we know that Schmirer had been exposed to the other abduction cases being reported. He had been lead there by Sprinkle and the Condon Committee. But that isn’t the real problem. Warren Smith, who is quoted in some of the UFO books about abduction simply isn’t reliable. He made things up to pad a story. This is no speculation but fact. He told me this himself. He told the same thing to other researchers and writers, so everything that we have, attributed to him, must be carefully reviewed. Is there evidence for Smith’s invention of details on this case? Certainly. Remember the landing traces he found that escaped the attention of others who searched the area first. He never offered any evidence, and if he had photographed the area, we might have then been able to show that the Condon Committee had been a little loose with the data. Smith, in fact, goes after the Condon Committee turning each little difference into a mistake by the committee and then into something more than it was. Smith wrote, for example, "He [Schmirer] was identified as a Marine veteran instead of a Navy man." But in their final report, the committee members wrote, "The trooper said that he had served with the U.S. Marines." It’s not really the same thing when you remember that the Navy supplies corpsmen to the Marines. So, he could have been in the Navy and served with the Marines. Not really much of a problem in the greater scheme of things. Smith placed his own liberal interpretation on the transcript. He reported, "Did you attempt to draw your gun?" Schmirer, according to Smith answered, "I am prevented." But the technique used by Sprinkle was a little more subtle. The question was phrased, "Did I take the gun out?" Schmirer indicated a "No." He was then asked, "Was I prevented from taking the gun out?" and Schmirer said, "Yes." All this really means is that Smith was at odds with the Condon Committee. He offered evidence that the committee might have had information that was not released to the public. When Schmirer complained about a rash, or welt on his neck that appeared shortly after his sighting, and which faded in a couple of days, Smith thought something more about that. He wrote that Schmirer said, "One of those guys with the Condon Committee later told me that a welt at that spot is a sign of people who had a memory loss after they meet up with a UFO. It means that something more than a regular sighting occurred." According to Smith, "Another member of Condon’s staff informed Schmirer that a contactee was being held at an undesignated government facility. ‘He said this was a Federal Hospital or something like that.’"
This is stunning information. It implies that not only were committee members hiding information about UFOs, they had a great deal of inside knowledge. And they knew that UFO witnesses were being illegally held by the government. Yet, in all the time since the committee ended its work, and with all the controversy around its work, including staff members who resigned because of the bias of the committee, these allegations have never resurfaced. And, they have never been corroborated. Note here that Smith assigns the information to Schmirer and reports it in quotes. But he provides no information to back it up, and provides nothing that would make it possible for us to check the veracity of the information. There was another man in the room during this session and that was Brad Steiger. He told me, "I was present for the one and only time that Williams regressed Herb. Warren really was unfamiliar with the process and pretty much let Schmirer talk. I really can’t recall that Warren asked any particularly leading questions during the session, which was pretty straightforward." So far so good. But then Steiger told me, "I think it is fair to suggest that Smith may have elaborated considerably when he wrote the article for SAGA... It is also fair to suggest that Herb’s interview ‘grew’ and additional details came to both his and Warren’s fertile minds. I guess I never felt terribly convinced by the Schmirer case." In the end we are left with two somewhat divergent accounts, one of which is rich in detail. But again, Smith gives us nothing solid. We must rely on Smith’s reputation for that, and Smith fails here. When MJ-12 first broke, Smith called me with an amazing revelation. Back in the early 1950s, as he traveled around installing the latest printing equipment in newspapers, he made friends with a man from Texas. The man’s wife was on a dude ranch in the southern part of the state and she wrote about a UFO crash that had taken place. She mentioned names, locations, and it is clear that she, through Smith, was describing the Del Rio UFO crash as reported in one of the MJ-12 papers. Smith knew the man, and said the letters existed. If true, then documentation that was created in the early 1950s, that had a provenance, would corroborate some of the MJ-12 information. But Smith was never able to produce the documents and letters and he soon lost interest. Later, he would suggest that he had the diaries of Ted Bundy... or rather, he wanted help to create them because they would sell for big money. This was a plan that he never put into action. If there were two ways to do something, an easier, legal and ethical way, and a more difficult con, Smith w ould opt for the con every time. Ease of a task had nothing to do with his thought process. He wanted to score with the con and part of that was to invent information for his work. He excused it, sometimes, by suggesting that he needed an item or two to flesh out a story. He told me that while working on a magazine article about Bigfoot, he needed another eyewitness account, so he invented two college girls in Missouri who had seen something strange. It was a minor part of the article, but the point is, he invented the tale. Finally there is the drawing that Schmirer made of what the aliens looked like. Here is a point where the contamination might be seen. The alien leader (seen here and below), with the diver’s hood and the single earphone resembles the aliens in Mars Needs Women, which, coincidentally, had played in theaters only a few months before the sighting and regression. It is an image that has not been repeated in the UFO literature with any regularity. It does suggest, however, that some of the details that appear in the UFO literate have their foundations in science fiction, both the movies and the magazines. So, when UFO researchers tell us that there is no influence by science fiction, they are mistaken. Where does all this leave us? 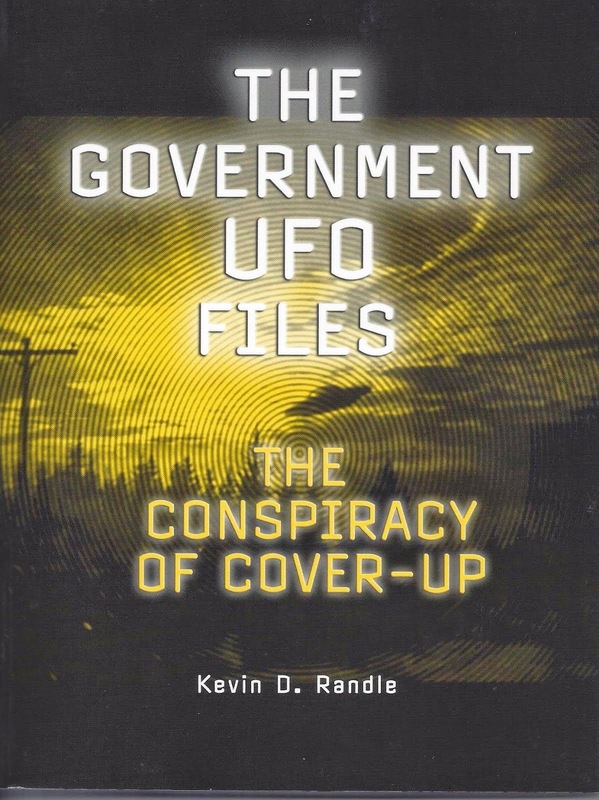 With a UFO sighting that is uncorroborated, details of an abduction that are out of science fiction movies, and rumors about abductees who are in federal mental hospitals and a committee of scientists who sold out, but let some of the hidden information out anyway. Most important, however, is that this case is now forty years old and the best we can say is that Schmirer might have seen a UFO. Everything else is the product of contamination, a desire to validate the Hill abduction and invention by a writer who had the reputation for creating details to flesh out a story. Given what we have learned in the last forty years, it is more likely that this abduction came from a disturbed young man who was aided by a writer who needed a story. He might have originally seen something, but the other details, added long after the fact, are more likely confabulation than alien intervention. This is a case that should be footnoted in the abduction research and then ignored. It teaches us nothing. This one I missed. I was scanning the Internet the other day and for fun, I thought I would see if some of those sites that still talk of nine planets in the Solar System had been updated (No, they haven’t), when I discovered that the number of dwarf planets had increased by one. It seems that the object, once called Santa, was now named Haumea and was the latest of the Kuiper Belt Objects (aka Plutoids) to reach dwarf planet status. This is a strange one for a couple of reasons. First, Mike Brown and his Caltech team said that they had discovered it in December 2004 while looking at images taken on May 6, 2004. They published an online abstract on July 20, 2005 and were going to announce the discovery at a conference in September. Before this got much farther, Jose Luis Ortiz and his team at the Instituto de Andalucia in Spain said that he had found the object on pictures they had taken in March 2003. Brown learned that Ortiz had accessed his, Brown’s, observation logs, and Brown thought that Ortiz had done that so that he could backtrack to his own images. Ortiz denied that, but did admit he had accessed the logs, simply to be sure that they weren’t observing an object already cataloged. I don’t know who is right here, but I do know that in the end, Brown’s team named the new object for the Hawaiian goddess Haumea. On September 17, 2008, the IAU said that this name had been accepted. This would seem to be proof that the IAU had accepted Brown and his team as the discoverers. The second strange thing is that Haumea is elongated. It is not spherical, which means that it falls outside one of the criterion for a dwarf planet. They are supposed to be able to reach equilibrium, or, in other words, have a gravitational field strong enough to pull it into a relatively spherical shape. Since it rotates on its axis about once every four hours, it’s spinning faster than any other known equilibrium body in the Solar System, so this might account for its strange shape and allows it to slide past this idea that dwarf planets must be relatively spherical. This is not to mention the size. It’s about 1150 km in diameter or about half the size of Pluto and Eris, a little smaller than Makemake and about twice the size of Ceres. Like two of the other Plutoids, Haumea has a couple of moons, named Hiiaka and Namaka. Hiiaka was discovered first and is thought to be about 310 km in diameter. Namaka is smaller, closer to the planet, and was discovered not long ago. There are quite a number of other objects that are being considered for dwarf planet status, including one in the asteroid belt, Vesta, which would join Ceres as the only dwarf planets between Mars and Jupiter. And there are discussions that one of the Trans Neptune Objects, something like two light years from Earth, is the size of Mars. Once the observational data are complete, it will be interesting to see how the IAU handles that. Will we get another class of planet that accounts for those at the edge of the Solar System, out beyond Neptune? They’re still trying to decide if Charon meets the criterion for dwarf planet. Charon might not be orbiting Pluto, but the two of them orbit a central point not unlike a double star, and if true, then Charon would fit the definition of dwarf planet and its status would upgraded. As I say, there has been quite a bit of change to the Solar System in the last few years. Planets demoted, dwarf planets defined, and the possibility of a Mars-sized object halfway to the next star, which might make an interesting way station if we get to the point of launching interstellar flights and it’s on the right side of its orbit... a bit of science fiction to brighten our day.